Comprehensive Curriculum of Basic Skills for grade 2 covers basic concepts such as reading comprehension, spelling, sentences, addition, subtraction, graphs, fractions, geometry, multiplication, division, time, money, and measurement. Complete with practice in writing, reading, and math, this series helps develop the skills your child needs for grade-level success. 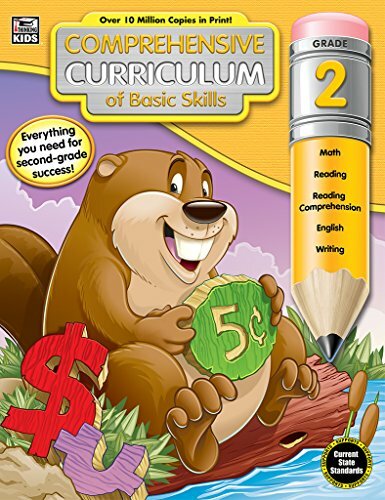 With over 10 million copies in print, the Comprehensive Curriculum of Basic Skills series provides an entire curriculum filled with fun, educational activities and instruction that improve academic performance. Available for grades prekindergarten to 6, Comprehensive Curriculum of Basic Skills features vivid, full-color illustrations and grade-appropriate activities for phonics, reading, language arts, writing, and math. This series edition has been updated with relevant, high-interest reading passages and artwork to engage your child in the learning process. An excellent resource for supporting classroom learning or enhancing your home school curriculum, it features review lessons to measure your child’s progress, teaching suggestions to extend learning, and answer keys to monitor accuracy. Comprehensive Curriculum of Basic Skills is the all-in-one resource for strengthening essential skills.